219 Group is a veteran-owned marketing agency, advertising agency, and public relations agency that creates innovative, big ideas and delivers solutions to help our clients share their vision and tell their stories. We are a team of creative talent, digital gurus, storytellers, and masters of marketing. 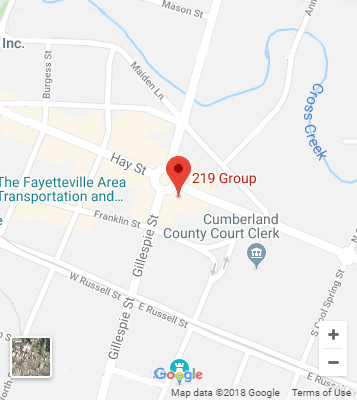 219 Group offers a full suite of marketing services to help clients of all sizes, budgets, and types achieve their desired results and our SEO team is persistent on getting your website on the first page of Google. Not Ranked? Our SEO team will get you on the first page of Google. Along with SEO, We do all marketing services, we do it well, and we do it all under one roof. Our marketing and advertising solutions range from Search Engine Optimization (SEO), brand development, media services, creative, public relations, social media, analytics, lead generation and digital marketing. Our team is stacked with creative talent, from award-winning designers for print and web that specialize in graphic design, skilled writers, social media gurus, public relations pros, experienced advertisers and masters of marketing. We are the group that gets you noticed. From promotional emails to website design, paid search campaigns, and SEO, we ensure you’re being seen in search results. We create designs that move people to engage with the company. We’ll create everything from your logo to your brand identification guide so we can develop a unified brand identity for your company. Our highly trained graphic designers will bring your vision to life. Using the right keywords, we’ll optimize for your buyer personas, and figure out the right keywords your potential customers are searching for to attract them to your site. Professional and knowledgeable team headed by a great civic minded owner. Website creation, SEO strategy, and marketing are just some of their talents. Kirk leads his company, as he leads in Fayetteville, with skill. Great digital marketing team. Used them for projects at three separate companies and will keep going back. Amazing team, Kirk and his folks are the best at what they do. You will not be let down, contact them ASAP. This company has become not only my business associates but family. I have been working with this group of talented people for over 4 years and I must say I have not regretted it not once. Kirk really has a great team that can bring some awesome ideas to the table for advertising. I always have trouble brain storming so they encourage me to let them do all the work. I am always satisfied when I see their final product. Keep up the good work team!! You offer such a great service! We have been partners with the 219 Group since 2014. We depend on our marketing team to keep us current and viable. All of our social media needs, print, radio and in store collateral are handled with great detail and attention. They assist us with all of our local and statewide events to keep us relevant. We depend on this team everyday and they always deliver with an upbeat, creative, and diverse outcome. The Mash House is always prepared to meet our marketing goals and forward progress. Thank you 219 for being such a great partner! !